I'm not as young as I once were. There was a time when I was able to watch Les Misérables five times in the span of a single month with no repercussions whatsoever, but nowadays, give me four Les Mises in three months and I'm an emotional wreck of a human being, hardly able to form full sentences about the experience. Without further ado, here are some bullet points about my latest Les Mises. The Estonians have translated the musical's title. Instead of the original French title, it's known as Hüljatud. This production is directed by Samuel Harjanne, who is a true Les Mis vet: from Gavroche to Enjolras to director! And indeed, he's directed a very good production of the show. Every principal role but Marius is played by two alternates. Loved Tamar Nugis as Javert. Classic style with a ponytail and a blue uniform. A classic performance, too, with a little bit of Philip Quast and a touch of Earl Carpenter. Really good. Jean Valjean, Mikk Saar, sings very beautifully, but to my taste, his Valjean is too soft – for example, during What Have I Done, it seems like he's on the verge of tears most of the time. I prefer my Valjeans with a harder, more threatening edge. The direction puts plenty of focus on Marius (Kaarel Targo) and Cosette's (Maria Listra) romance: first, when Marius is bumbling in Cosette's garden, they offer some comic relief, but during One Day More, you can't help feeling moved by their goodbyes. These two have such a short time onstage together, I'm happy to see a production that makes the most out of it. The lighting design by Petri Tuhkanen! Some of the best I've ever seen in any musical. Clever use of shadows, strong colours, such strong contrasts that sometimes the light almost feels like a physical entity. Very beautiful. Javert sports some thigh high boots on the barricade. I don't know what to think about that. In a nutshell: this is a good production of Les Misérables. Not mindblowing or overwhelming – but not every production has to be. It's good and thoroughly enjoyable, and I like how it doesn't try to fix things that aren't broken. Very glad I saw it, and maybe one day when my Les Mis hangover has cured, I'll try to see the alternate cast too. I first saw this production in September and wrote about it here, so this time, just some more thoughts about my favourite characters. Alexander Lycke's Valjean... The reason I bought tickets to two separate performances from the get-go. I've been a fan since 2010, I've said everything already, feels pointless repeating how much I adore Lycke in the role. This production is over soon and I might never see him play the part again, but I'm not going to feel sad about that – I'm just happy I got these two chances to see him as Valjean again. Here's a detail I enjoyed, though. During The Bargain, you can tell Valjean sees right through the absurdity of it all, going as far as trying to exchange some can-you-believe-this looks with Madame Thénardier before it turns out she's just as greedy as her husband. Maybe there's a little spark of humour in him! I have seen Philip Jalmelid play Javert twice before. At first, I thought he sings the part to perfection but acts too angrily, making Javert seem more like a Disney villain and less like a complex antagonist. But now, late in his second run in the role, he has calmed down just right. Suddenly, the performance is nothing short of perfect. This Javert is intense, determined, three-dimensional all the way through. I guess sometimes it takes a while to really appreciate a performance, maybe both the performer and the person watching need to take some time before warming up to the part, but I'm glad these things happen. One of my personal top 3 Javerts now. Javert's attitude towards Monsieur le Maire taking a complete 180 degree turn when it turns out he's been Jean Valjean the whole time. How Javert mockingly repeats Valjean's words about Marius needing a doctor's care under his breath in the sewer scene. The Confrontation is so intense. 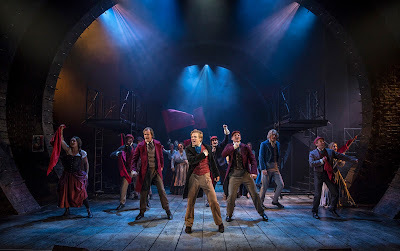 There is nothing unnecessary going on, just a battle of wills... And, well, Javert almost getting his head bashed over with a chair – but that was also done very well. This Valjean definitely has that threatening edge. From now on, no lesser Valjean & Javert duo will do. Maybe do not accompany me to Les Mis with me until this memory has faded. You're going to have a terrible time listening to my neverending these guys are all right, sure, but let me tell you about Valjean and Javert in the 2017 Jönköping production monologue. The production has changed Cosettes since I last saw it. Linnea Hyltenfeldt's Cosette is nothing short of adorable, there is something so sweet and bubbly and lively to her. And then her smiling through her tears in the finale, knowing she'll lose her father soon but doing all she can to make their last moments together happy and calm... I love Cosette. Cosette is way shorter than Valjean and Marius (who are both really tall), which is sorta cute. When Marius spins her around it's like she's flying a meter above the ground. Cosette, Marius (Kalle Malmberg) and Éponine (Hanna Holmgren) all feel very young in this production, like teenagers. That's very good. I imagine this Marius has known Éponine for a long time and still thinks of her as a child, a little sister almost – whereas Cosette, in the young man's eyes, is a full-grown woman. It's even clearer than usual that Éponine really doesn't have any chance. Cosette deserves so much more that what little this musical gives her. I used to be an Enjolras person*. Nowadays, I'm way more into Valjean and Javert and, I admit, tend to zone out a bit during the barricade scenes. Luckily, this time around, my friend firmly told me to pay close attention to Petter Snive's Enjolras. I did, and found myself really liking the character, for the first time in years. This Enjolras has energy and drive. He's also very, very done with all his friends when they don't seem to be sharing that, instead focusing on Marius's love life. It feels to me he's a bit apart from the rest of a group, a leader instead of a friend. I like that. His death! One of the best Enjolras deaths I've ever seen: when it becomes clear there's nothing left to do, Enjolras sinks into violent, terrified desperation. Every trace of calmness and grace is gone, the whole thing turns into a suicide mission. It's not pretty, it's not majestic, it's horrible and very effective. Nice Enjolraic looks are a bonus. Two seats from me, a lucky soul was experiencing the magic of Les Misérables for the very first time. They gasped and pointed when Javert appeared onstage after Fantine's death – oh no, he's here and now he's going to get Valjean! I'm happy for that person. 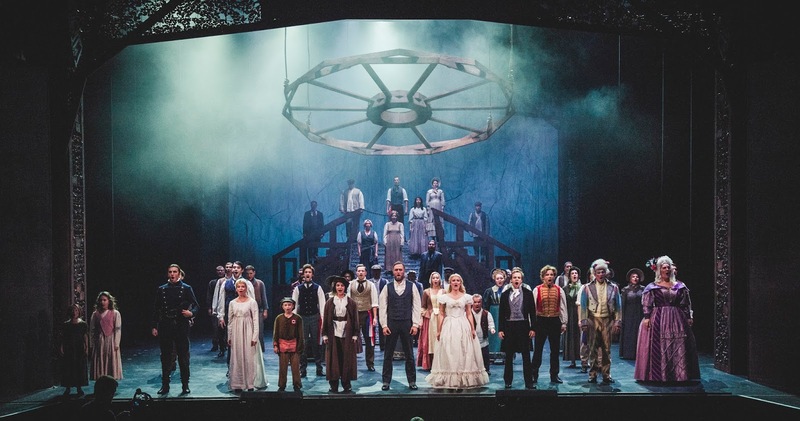 There is no such thing as a perfect production of Les Mis (or perfect anything), but at least for now, this direction by James Grieve is the number one for me. As I wrote at the start of this blog entry, four performances of Les Mis in the span of only three months is a lot. It's a marathon of a musical that makes me feel about five times more strongly that any other piece of theatre. I've been a fan for nine years soon but seeing the show live still makes my heart beat faster. It's been good, seeing all these productions, but now, it's about time for a little break. I think these memories will last for a while. * According to a theory I came up with, you can divide the whole Les Misérables fandom in Team Enjolras and Team Javert. Actual favourite characters may vary, but no matter what, you're a member of one team or the other. Team Enjolras prefers the barricade scenes, can tell which barricade boy is which by their lines in Do You Hear the People Sing and likes modern AU fanfiction. Team Javert prefers the non-barricade scenes, has a secret soft spot for the 1978 movie adaptation with Anthony Perkins as Javert and holds their breath every time Jean Valjean and Javert are onstage at the same time.